When We Feel: Nanae and Yoko Exhibition is ongoing! till Sunday. I'll be there Saturday and Sunday. Umm it's just a week and few days for staying in Japan. Tonight I went to KIDDY LAND (toy shop) to get presents for Anna and Asher after I left from gallery. Before that, I actually visited to an exhibition by an illustrator Mizumaru Anzai. 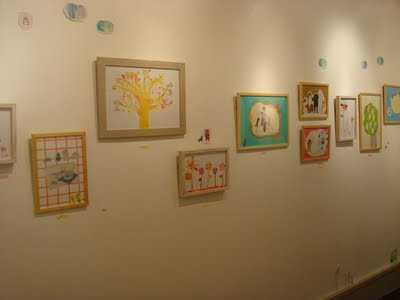 Then I went to see another exhibition at Shibuya PARCO, also exhibited by an illustrator Noritake. I feel comfortable and try to forget time is passing by looking at their works. I appreciate having lovely time.